Rows 2 to 8 - ch3, * 1dc in each dc to 3dc group, 1dc in next dc, 3dc in centre dc on 3dc group, * rpt from * to * to last 3dc group, 1dc in next dc, 3dc in centre dc on 3dc group, 1dc in each dc to end, 1dc in top of ch3. You should have 119dc + ch3 at the end of Row 8. Fasten off. Pattern Row 1 - ch3, 1dc in each of next 2dc, * ch2, skip 2dc, 1dc in each of next 2dc, bptrc around next trc, 1dc in each of next 2dc, * rpt from * to * to last 4dc, ch2, skip 2dc, 1dc in each of next 2dc, sl st to top of ch3 on beginning of row. Turn. Pattern Row 2 - ch3, skip first 2dc, * 6dc in ch2 space, skip 2dc, fptrc around next trc, skip next 2dc, * rpt from * to * to last ch2 space and 2dc, 6dc in ch2 space, skip 2dc, sl st to top of ch3 on beginning of row. Turn. The last 2 rows form the pattern, rpt both rows until 15 rows have been worked from yoke or work measures from shoulder approx 11 inches. Fasten off. Join in color 1 and rpt Pattern Rows 1 & 2 once. Fasten off. Join in color 2 and rpt Pattern Rows 1 & 2 once. Fasten off. Button/Buttonhole Band - Working on WS join in color 1 to base of left hand side of back edge, ch1, work 1sc in base of ch1, 17sc evenly in row ends to corner, 3sc in corner, 1sc in each ch around neck edge to next corner, 3sc in corner, 18sc evenly in row ends down back edge to end. Turn. Next Row - (Buttonholes) ch1, 1sc in base of ch1, 1sc in next sc, * ch2, skip 1sc, 1sc in next 7sc, * rpt from * to * once, ch2, skip 1sc, 1sc in last sc. Turn. (3 buttonholes made). Return to first back edge and starting from corner and working from neck downwards, with RS facing ch1, 1sc in base of ch1, 1sc in each sc to end. Turn. Finishing - Close small gaps underarms, weave in and trim off any loose threads of yarn. Turn through to RS side, sew on buttons to correspond with buttonholes. Motif - (Made in rounds without turning) Using color 1 ch4, sl st to first ch to form a ring, ch1, work 12sc in ring, sl st to first sc. Fasten off. Finishing- Use loose threads of yarn to sew flower to centre of yoke on the front of the dress. 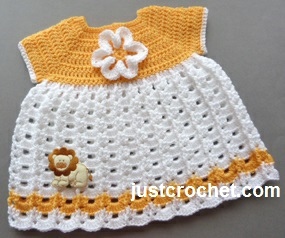 Enjoy this free baby crochet pattern for a sunshine dress.